This is a monstrous Age that all Yuon dictatorial leaders had enveloped Cambodia for the first time and the world is still ignoring the Cambodian genocide fell on deaf ears. During the period 1813 – 1815, Vietnamese perpetrated the infamous massacre, known to every Khmer as “Prayat Kompup Te Ong”. It was the most barbarous torture style in which the Khmer were buried alive up to their neck. Their heads were used as the stands for a wood stove to boil water for the Vietnamese masters. As they were burned and suffered, the victims shook their heads. At that moment, the Vietnamese torturers jokingly said “Be careful, not to spill the master’s tea”. During his dynasty (1802-19), King Gia Long started an irrigation project in the Province of Mot Chrouk (Chaudoc). Thousands of the Khmer Krom were forced to dig a canal named Chum Nik Prek Teng (Vinh Te), 53 kilometers long and 25 meters wide, from Bassac River to the Gulf of Siam. During this forced labor project from 1813-1820, many thousands of the Khmer Krom were killed. In one particular instance the Khmer workers were buried alive so that the Vietnamese soldiers could use their heads as stove stands to boil water for tea for their Vietnamese masters. 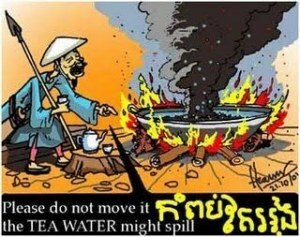 The phrase “Be careful not to spill the masters Tea” is still well reminded to their Children by all Khmer Krom parents or grandparents. Before the Canal Project well done, Annamite soldiers held Khmer laborers into Pillories, each pillory contained about 20-40 people (they said to prevent Khmer laborers run away from mobilization), at least from 2-5 thousand were locked in pillories located in the canal; the dam was opened, water filled the canal, all Khmer laborers were drowned, no one was survive. The digging of the Vinh Te Canal begun in 1814 under the reign of the Annamese King Minh Mang. The Khmer King of the time was Preah Ang Chan. “The 13 of the month of Meakasé Year of the Pig (1814), the king of Annam sent Yuamreach (King of Hell) Ong Thanh, Ong Binh Thanh, and Ong Loeung to lead 3,000 soldiers as well as 1,000 Cambodians from the province of Preah Trapeang, a total of 4,000 people, to build forts at Moat Chrouk and to dig a canal or channel that drains toward the sea, linking Moat Chrouk and the river on the Est”. “Ten thousand men, of which 5,000 Annamites and 5,000 Cambodians were employed on the field to realize this Canal (Prék Chik), under the supervision of the Annamese. On 33m wide and 2, 60 m deepth and linking the western Arm of the Mekong River with the Gulf of Siam, this Canal runs across the Cambodian provinces from Peam (Hatien) to Moat Chrouk (Chaudoc). “Working hard in the heat of the sun and under the supervisors’ strokes of stick and starved, many succumbed in the field, because of the awkward tasks, or were taken away by the water current when the Annamese ordered to fill the Canal with water (Khy Phanra, “ the Vietnamese community in Cambodia at the time of the French Protectorate”, University of Sorbonne Nouvelle, Paris III). One cannot talk about the digging story of this channel without talking of the narration of the “Kompup Te Ong” that is self connected. “The Annamese buried alive up to the neck, any Khmer who rebelled against them, in a way that only the heads stick out to form a tripods before lighting, and the heads were supposed to act as supports for a tea kettle while making their tea”. “In the province of Kompong Svay, the Annamese in the barrack of Srok Kandal Stung, Baray and Choeung Prey were all slaughtered by the insurgents. The vengeance of the Annamese army was terrifying; and more than one thousand Cambodians in the region were executed. The last were burnt alive; their bare flesh was applied with salt and pepper. The children were buried alive to the neck, in a group of three, so that their head stick out to form three corners of a triangle, and on which the Annamese had their rice cooked or their tea boiled. This torture is named by Cambodians as “ Kompup Te Ong”, because answering to the howlings, to the convulsive start of dying that the flame finished to consume, the Annamese torturers didn’t stop sneering until the end, coldly, borrowing from the victims their own langue: “ Chhop Senn Vei ! Sngiem Vei! Kampup Te Ong. Let’s finish! Don’t move! Let’s see! You turn over the “Master’s Tea Kettle”.